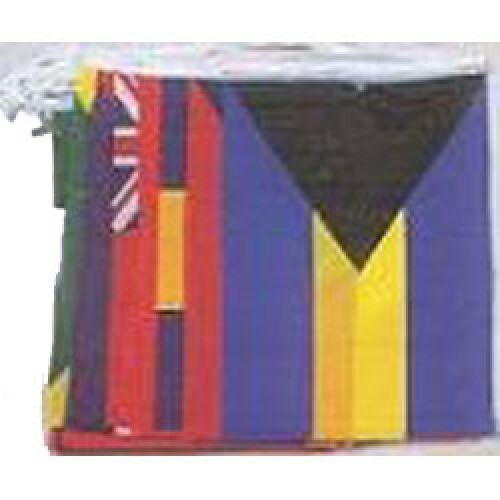 This is a string flag containing the flags of 20 Caribbean Islands each measuring 12 inches by 18 inches. There is approximately 6 to 8 inches in between each flag. Great for formal and informal events, businesses or when representing the Caribbean as a whole. Approximately 35 Feet long. The countries included are: ANTIGUA & BARBUDA, ARUBA, BAHAMAS, BARBADOS, BELIZE, BERMUDA, CUBA, CURACAO, DOMINICA, DOMINICAN REPUBLIC, GRENADA, HAITI, JAMAICA, MARTINIQUE, NETHERLANDS ANTILLIES, PUERTO RICO, ST. KITTS & NEVIS, ST. LUCIA, ST. VINCENT & THE GRENADINES, TRINIDAD & TOBAGO.